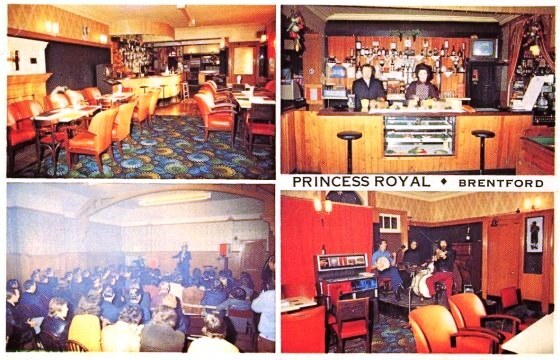 Howard Webb provided this multi-view colour postcard of the Princess Royal pub dating from the mid to late 1960s. The Princess Royal is one of four pubs on the corners of Griffin Park football ground and was built in 1841, then rebuilt in 1921. See 'Brentford and Chiswick Pubs' by Gillian Clegg for more details and photos of the exterior in 2005. 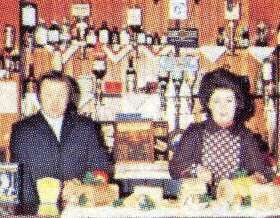 Orange was a popular colour at the time the photos were taken and used extensively in the Princess Royal, which presumably had recently been refurbished. 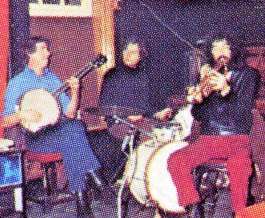 Perhaps you recognise the couple serving at the bar, or the band, which includes a banjo player, a drummer and a Jethro Tull-ish figure perhaps playing a recorder? Please get in touch if you can help.